In the 50 years since the first Surgeon General’s report on smoking alerted Americans to the deadly consequences of cigarette smoking, the United States has made significant progress in reducing tobacco use. Nevertheless, tobacco remains the nation’s number one cause of preventable, premature death. The momentum to curb tobacco use is steadily building. The most recent Surgeon General’s report on smoking released in January 2014, The Health Consequences of Smoking – 50 Years of Progress, found that cigarettes today pose an even greater risk of disease than the cigarettes sold when the first Surgeon General’s report was issued in 1964. The report finds that “changes in the design and composition of cigarettes since the 1950s” are responsible for smokers’ increased risk of developing lung cancer. The facts show that tobacco not only leads to lung cancer, tobacco use harms nearly every organ in the body. The momentum to curb tobacco use is steadily building. With materials on cessation, the risks of secondhand smoke and information about smokeless tobacco products, Journeyworks Publishing is ready to help health professionals across the nation continue their work to end the tobacco epidemic in 2015 and beyond. 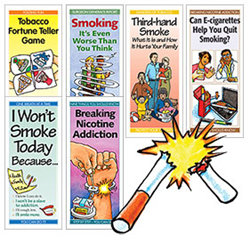 Health educators and other professionals are invited to see how the widely valued tobacco prevention and cessation titles from Journeyworks Publishing can strengthen their campaigns to help communities clear the air. To request a complimentary set of titles, visit the Living Tobacco Free review pack page. Professionals working to reduce and end tobacco use can click here to request a complimentary Living Tobacco Free review pack today.